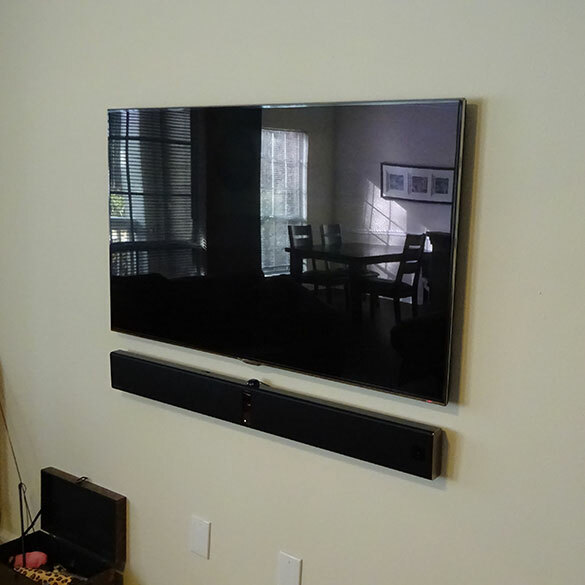 Image above is a sound bar mounted and installed by: Grand Central Wiring – Greenville, SC. 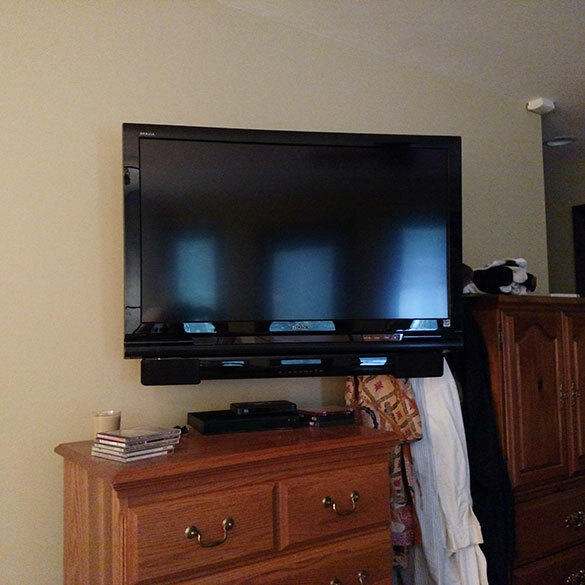 Sound bar installation is the easiest most cost effective way to add high quality sound to your TV. As TVs get smaller, the design of home audio systems follow suit. 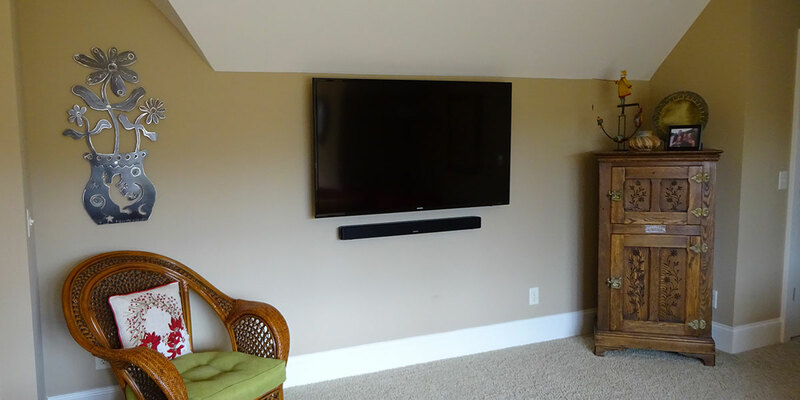 Sound bars come in all shapes and sizes, and some are able to closely mimic surround sound. They can be mounted on the wall, attached to the TV or just sit on a cabinet. 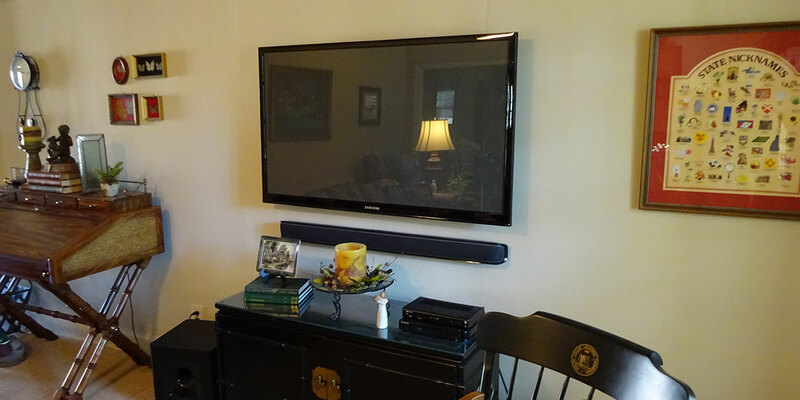 We have installed a variety of different sound bars in the Greenville, SC area. Some sound bar models have bluetooth and Wi-Fi capability. This allows for connecting and streaming video and music. Some also have video switching built in, although capability is limited. They are usually designed for rooms with smaller setups that have a limited amount of devices connected. Active sound bars are most common and reasonably priced. They are amplified and usually have video switching built in, bluetooth, remote control and sub-woofer. These are self-powered units that come with everything you need to use them. Passive sound bars are non-amplified and do not come with a sub-woofer. The sub-woofer is purchased separately. Think of a passive soundbar as being a bar of separate speakers, varying in number depending on model. Passive sound bars do not have an amplifier built in and need a home audio receiver/amp to power them. These systems are designed for custom setups trying to achieve hi-fidelity sound. Let Grand Central Wiring professionally install your sound bar. Call (864) 881-1675 to talk with us about your project. Images below are of custom installs by Grand Central Wiring.